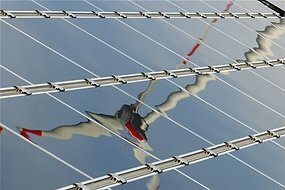 German solar power plants produced a record 22 gigawatts of electricity – equal to 20 nuclear power stations at full capacity, says the head of a renewable energy think tank. Norbert Allnoch, director of the Institute of the Renewable Energy Industry (IWR) in Muenster, says the 22 gigawatts of solar power fed into the national grid on Saturday met nearly 50 per cent of the nation’s midday electricity needs. The incentives through the state-mandated ‘feed-in-tariff’ (FIT) are not without controversy, however. The FIT is the lifeblood for the industry until photovoltaic prices fall further to levels similar for conventional power production. Merkel’s centre-right government has tried to accelerate cuts in the FIT, which has fallen by between 15 and 30 per cent per year, to nearly 40 per cent this year to levels below 20 cents per kWh. But the upper house of parliament, the Bundesrat, has blocked it.